Not bad for a Monday. 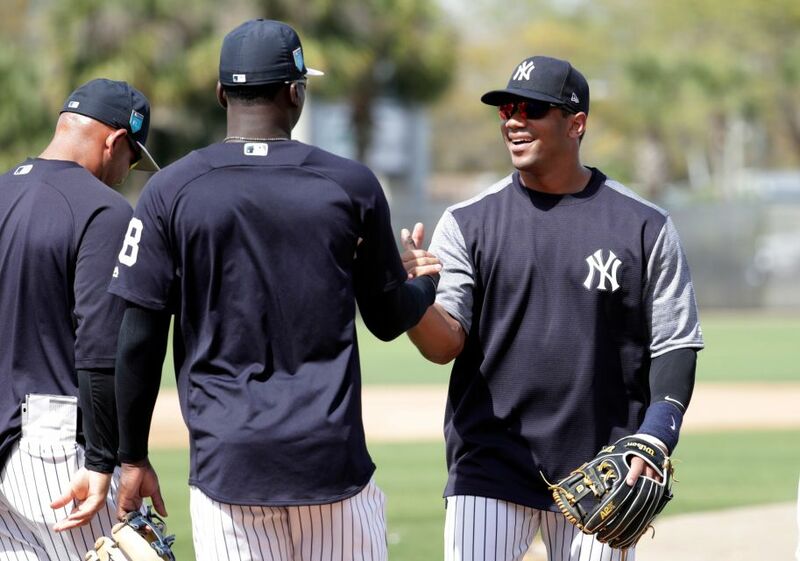 The day started with the arrival of Seattle Seahawks QB Russell Wilson in training camp to field grounders with Didi Gregorius and blast a few homers (six) for batting practice in a group that featured Aaron Judge, Giancarlo Stanton, and Gary Sanchez. 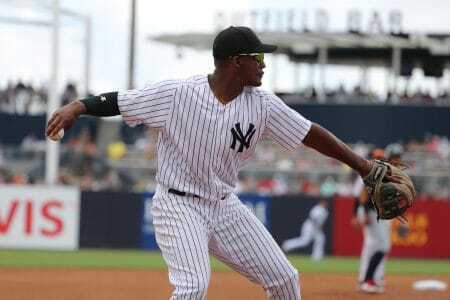 After the eventful day, third baseman Miguel Andujar capped it off with a dramatic 9th inning two-out walk-off home run to beat the Philadelphia Phillies, 4-3. Clearly, the story of the day was Russell Wilson. It’s funny how every news article, especially those in Seattle, expressly state that he has not suddenly decided to give up his day job (as if they are worried about it). Some Yankees fan think Wilson is a distraction, but I take it for what it is. It is an opportunity to break up monotonous Spring Training by spending time with a Super Bowl-caliber professional athlete. I’ve always said there are guys who know how to play the game and there are guys who are winners. The rare combination is the guy who embodies both. Wilson is one of those rare athletes. I think he has much to offer the young Yankees even if he never fields a single play or takes an at-bat in an exhibition game. Winners breed winners. 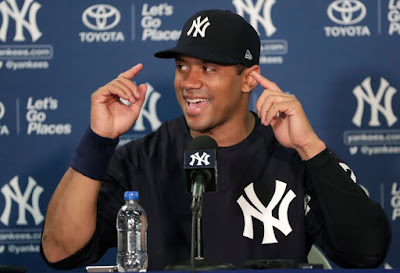 I am glad that Wilson is a Yankees fan and is spending his off-season in a baseball environment around the Yankees. His five or six days in camp will pass quickly and he’ll be gone. But the impact of his visit will remain with the players as they march toward the start of the 2018 season and its grand expectations. 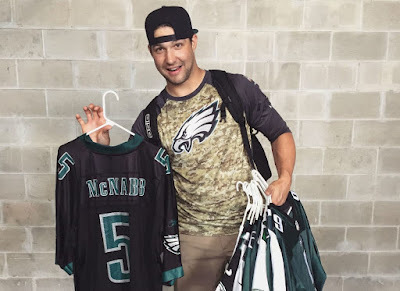 Maybe Wilson should spend some time trying to talk some sense into reliever Tommy Kahnle and his “overkill” love for the Philadelphia Eagles. Sadly, I think that’s a lost cause. 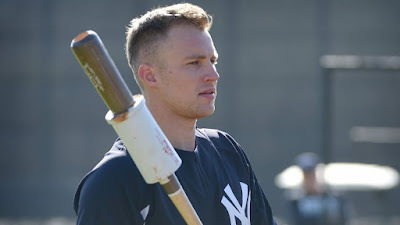 At the very least, I’d give Wilson an at-bat in one of the upcoming exhibition games but it is possible the Seahawks have imposed a moratorium on what Wilson can and cannot do while in Yankees Camp. It would be nice to see Stanton and Judge catch a few passes before Wilson departs. Monday evening, in the first night game of the Exhibition Season, the Yankees continued their winning ways, fourth win in four games, to make Aaron Boone an undefeated manager to start his career. I know, these games mean nothing but it’s tremendous to see everyone embrace Boone’s desire to be “great”. I was disappointed the Phillies game was not televised as I would have enjoyed watching Sonny Gray’s Spring debut. He pitched two innings, giving up two isolated singles, but struck out 2 batters and did not allow any runs. He was throwing strikes as all 12 of his pitches were in the zone. Chance Adams made his debut (which is another reason I wanted to watch the game). Adams got into trouble with the first batter he faced, his high school teammate Dylan Cozens. Adams and Cozens were in the same class at Chaparral High School in Scottsdale, Arizona (Class of 2012). Cozens, comparable to Giancarlo Stanton in size and weight, drew a walk off his friend to start the third inning. He stole second and then advanced to third when Rhys Hoskins hit a grounder to first. A sacrifice fly by Phillies free agent acquisition Carlos Santana brought Cozens home for the only run off Adams. The next batter, Cesar Hernandez, got the only hit off Adams over his two innings of work, with a single to left. Aaron Altherr followed with the second walk of the inning but Gary Sanchez rescued Adams when his throw to second caught Hernandez off base for the third out. The player of the game was, no doubt, Miguel Andujar. Andujar entered the game as a pinch-hitter for right fielder Billy McKinney in the bottom of the 7th inning. Andujar’s double to left scored Mark Payton, running for Brandon Drury, from third to tie the score at 2. Andujar stayed in the game as the replacement for Drury at third base. The Yankees had a chance to win it with a RBI single by Jorge Saez in the 8th, but Cody Carroll’s attempt to earn the save failed when he allowed a solo home run to Scott Kingery, another Arizonan, in the top of the 9th. No worries. Gleyber Torres and Mark Payton recorded the first two outs in the bottom of the 9th inning, bringing Andujar to the plate. After two balls, Andujar swung and missed at the next two pitches. On the fifth pitch from Phillies reliever Ranger Suarez, Andujar sent the ball over the fence in left clearing most of the Phillies off the field before Andujar could finish his home run trot. For a meaningless game, it sure was exciting. If only we had been able to watch it…well, those of us not so fortunate to be at Steinbrenner Field. So far, the battle for third base between Brandon Drury and Miguel Andujar has been very spirited. It’s early but the competition at third base has been better than second base. The starting pitcher will be Bullpen Ace Chad Green. 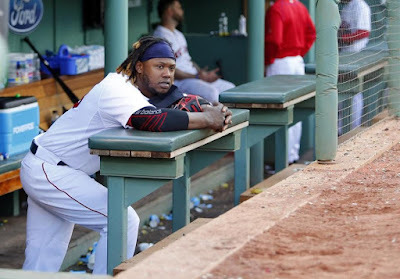 I am not exactly a fan of Hanley Ramirez, but the Red Sox 1B/DH was popping off yesterday after Boston finally announced the signing of free agent slugger J.D. Martinez. His words were something to the effect that they were going to step on everybody’s neck now. I harbor no ill will toward Ramirez, Martinez or the Red Sox but I am looking forward to Aaron Judge and Giancarlo Stanton putting on a display this year against the Red Sox, along with the other great young Yankees hitters. Let’s see whose neck gets stepped on. I hope, and I suspect, that this will not be a fun year for Ramirez. The best way to shut up Han-Ram is for the Yankees to win the American League East. I like our odds. I don't get the fascination in the press with Russell Wilson as a baseball player or as a 29yr old Yankee in ST. Meh! I did read with amusement Ramirez comment about stepping on everybody neck and coming out of Boston they will need all the juice they can muster this year. Except for a slight edge in SP and I mean slight I think our lineup is going to be much much better day in and day out add in our bullpen and I suspect Boston will finish behind NY by 5-7games. IMO .... Let the games begin! I don't care what anyone who wears a Boston Red Sox uniform has to say, especially one who isn't even good enough to be an every day player.